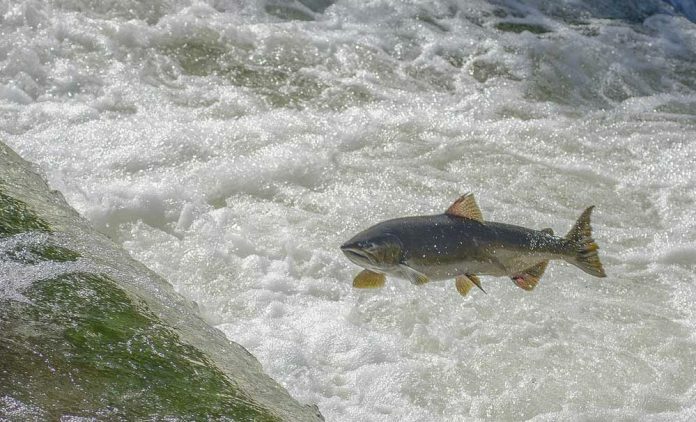 The Salmon of Knowledge that lived in the River Boyne is a legendary animal that comes from the Fenian Cycle of Irish mythology and many sought its knowledge. However, its consumption by the legendary Fionn Mac Cumhail was an accident when he was but a boy. Fionn was living with Finnegas the poet at the time. Fionn’s father Cumhail had been leader of the legendary warrior clan known as the Fianna, but he had lost this position after being killed whilst fighting another clan. When his wife Muirne gave birth to a baby boy she feared for his safety as a rival against the new leader of the Fianna. Thus, she had him sent to live with the poet Finnegas to grow up a learned man and one day reclaim his birthright as the head of the Fianna. Finnegas lived in a small hut on the edge of the River Boyne and welcomed the boy, whose energy and curiosity kept him on his toes and taught him much about himself. Fionn learned much from Finnegas and in return for all that he learnt he would clean the house and cook for the old man. Finnegas was happy for the company that Fionn provided him but sometimes he could not answer all of the questions that the inquisitive young boy had. Finnegas shared the story of the Salmon of Knowledge with Fionn, explaining to him that he had been searching for the salmon in the waters of the River Boyne for many years. He told Fionn that whoever ate the salmon would become the wisest person in the whole of Ireland and that many who had tried to find the fish had failed. So Fionn began to assist Finnegas with his fishing expeditions to help the old man catch the Salmon of Knowledge. One day the two of them were happily fishing on the banks of the River Boyne when Finnegas suddenly leapt up from his spot. He shouted at Fionn, who came over to where he stood, and pointed at a huge, handsome, strong salmon in the river. He told Fionn that that was undoubtedly the Salmon of Knowledge as no other salmon could possibly be as handsome. The two of them cast out their fishing net to attempt to catch the magic salmon. They battled with the salmon for a long time and it fought them valiantly, so strong were its muscles. Yet eventually, Fionn and Finnegas managed to pull it to the shore. Finnegas picked the salmon up and looked into its eyes, which made him fall immediately asleep on the ground. Fionn quickly shook him awake and told him what had happened, so the two of them tied pieces of cloth around their eyes to prevent them looking into the fish’s eyes. From this, they were sure that this was the Salmon of Knowledge, as no other fish would have this magic ability. Fionn and Finnegas fought with the salmon all afternoon as it struggled to make its way back into the water. Eventually it tired and gave up the fight, but Finnegas was so exhausted from the struggle that he did not have the energy to cook the fish himself. So, he asked Fionn if he would cook the fish for him, as he trusted Fionn due to his strong sense of loyalty to his teacher. Fionn made a fire and prepared the fish before placing it above the flames on a spit. After a short while the fish was almost ready to be eaten and Fionn was about to wake up Finnegas when he noticed something strange about the salmon; the skin was bubbling and making small blisters. Fionn was worried that he was not cooking the salmon properly and so he took his thumb and he popped the blisters. On doing so the hot salmon burnt his thumb and he quickly put his thumb in his mouth to cool it down. All of a sudden he felt the wisdom and knowledge of 100 years passing into his body. However, having not actually eaten the fish, Fionn was not sure of what had happened to him. Once the fish was fully cooked he woke up Finnegas, who was sleeping at the edge of the River Boyne, so that he could eat it. Yet, on laying his eyes upon the boy Finnegas immediately noticed that there was something different about him; his eyes were brighter, his cheeks were redder and there was something behind his gaze that showed a wisdom that he had not previously held. Finnegas then asked Fionn if he had eaten the fish, which he truthfully answered that he had not, showing the fish to Finnegas. Finnegas then asked Fionn if he had tried any of the fish at all, to which Fionn replied that he had burnt his thumb on the fish and so had placed his thumb on his mouth and tasted the smallest amount. Finnegas then knew that Fionn Mac Cumhail had received all the wisdom and knowledge of the Salmon of Knowledge from the Fenian Cycle and that he was destined to become a great man. Thus, at the edge of the River Boyne, Fionn Mac Cumhail took on all the great wisdom of the Salmon of Knowledge that allowed him to defeat the leader of the Fianna and take his place at their head, as was his birthright. Under the leadership of Fionn Mac Cumhail the Fianna became the most famous band of warriors in the whole of Ireland for their courage and strength in protecting the High Kings. The stories of their achievement would fill the Fenian Cycle of Irish mythology themselves. This story therefore teaches the importance of knowledge and wisdom for an individual to be a great and successful leader.